Google today announced a new application Google Messenger and are built tool in the system Ondorad new 5.0, but can also be downloaded from the Google Play store for devices operating system Android, starting from version Android 4.1 and designed to manage SMS text messages and MMS on the user's phone. 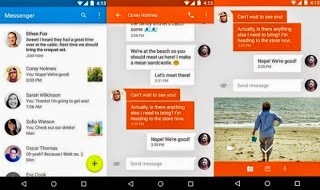 Google Messenger will be available by default in Android 5.0, the new system as well as the possibility to store downloaded via Google mail and Google Play will be the main role is to manage the short text messages SMS in addition to MMS MMS. The new application Google Messenger can send texts, images or even video clips, as it is available on the built-in search engine and content with the possibility of a post or ban users.